"The rich only select from the heap what is most precious and agreeable. They consume little more than the poor, and in spite of their natural selfishness and rapacity, though they mean only their own conveniency, though the sole end which they propose from the labours of all the thousands whom they employ, be the gratification of their own vain and insatiable desires, they divide with the poor the produce of all their improvements. They are led by an invisible hand to make nearly the same distribution of the necessaries of life, which would have been made, had the earth been divided into equal portions among all its inhabitants, and thus without intending it, without knowing it, advance the interest of the society"
So why hasn't this beneficial outcome happened in Britain? Perhaps the flaw is it requires everyone to behave selfishly. Not just the wealthy, but also the rest of us. Just as the rich demand the gratification of their insatiable desires, for the 'invisible hand' to succeed ordinary Brits must demand as big a share as they can grab. Is it the fine balance of grasping that is the key? 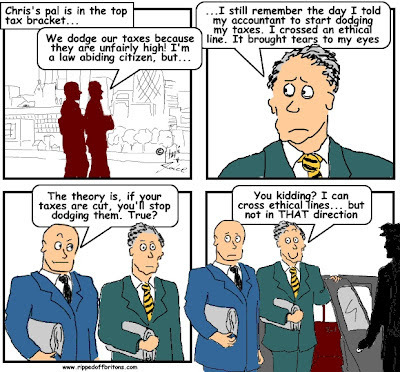 Is it all our fault, that although the wealthy are grabbing we aren't doing our bit? During this time of 'austerity' appeals are made to the unselfishness of us Britons by political and business leaders claiming "we are all in this together". The reality is those who make the appeals rely on the unselfishness of others as they selfishly feather their own nests. Cuts for all - with the biggest being tax cuts for companies, their top executives, and their owners. 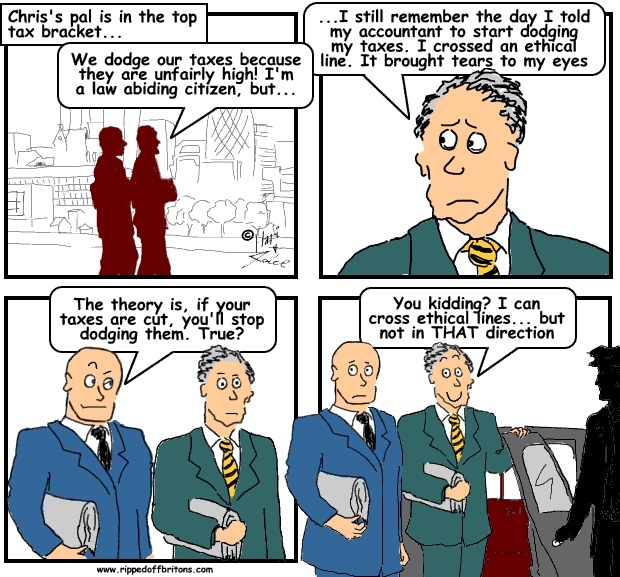 a) Tax cuts announced in the Budget mean Britain will have the lowest corporation tax in the G7 and the G20. We now match those exemplary friends of business Saudi Arabia and Russia. Turkey, South Korea, Indonesia and China are also between us and the next G7 nation in terms of low corporation tax rates. b) In terms of 'tax competitiveness', the loser by a long chalk is the USA. On the other hand, the UK in 2012 leaped down to the same depths as those paragons of tax probity Luxembourg and Switzerland. "This jump in the UK’s tax competitiveness is very encouraging. 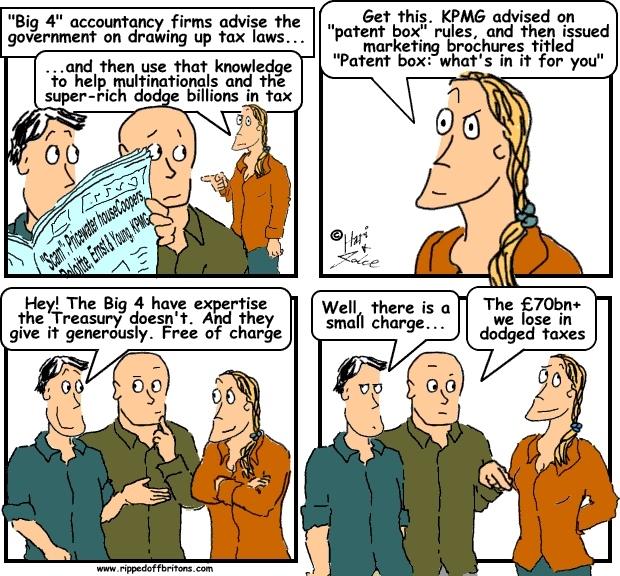 In KPMG’s view there are a number of factors. It is partly as a result of the reducing corporate tax rate. Respondents said this is the number one factor they look for. But reforms to the way in which foreign profits are taxed are also very important." 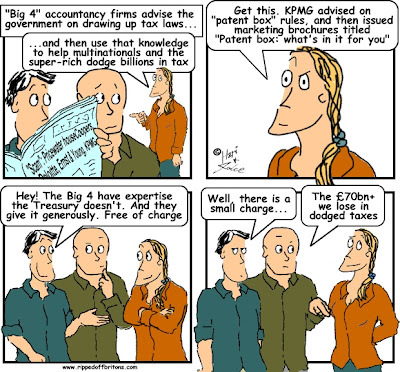 "The measure will remove some specific opportunities for corporation tax avoidance." "Any company with overseas operations may now be able to pay lower rates of tax." "Despite the Government’s best intentions to simplify the UK CFC [Controlled Foreign Companies] regime, there is now a myriad of exemptions from the new CFC rules"
So, how does economic growth compare between the scantily taxed UK and the USA where 'tax competiveness' has been thrown to the dogs? Is the US suffering? Actually we find the US outstripping the European economies. With Britain losing the wooden spoon for wretchedness only to Italy. Of course, if the grotesque enrichment of the few actually did make us all richer perhaps that would be ok. So has the determined selfishness of the 1% of our fellow Brits made us all wealthier than ordinary citizens of other comparable nations? To know for sure take a look at our average (median) incomes, taken from the OECD's stats. For all the bluster of our leaders in politics and industry, claiming to have put the 'Great' back into Britain, we are actually poor relative to our peers. It was Winston Churchill who advised never to waste a good crisis. You would expect Cameron and Osborne to be students of Churchill, so it is no surprise they are using the banking crisis as cover to roll back the share of the nation's wealth going to the 90%. “Show me a young Conservative and I'll show you someone with no heart "
After a promising start to his ministerial career, Iain Duncan Smith continues to get more ludicrous. In an interview with the Telegraph newspaper, Duncan-Smith asks better off pensioners to hand back benefits they are entitled to. Whatever next? George Osborne asking wealthy individuals and companies not to use legal loopholes to avoid tax because they have plenty of money? ROB fights a good fight. Some of the stuff brought to the (interested) public's attention on these pages is the kind of information of which more should be made, and much more investigated. I can only applaud you in the main for your approach and your obvious desire for a better society. This article sets you back a long way, however. In fighting the aforementioned fight, one must state facts, give no opinion, and strip away layers of ideology so that the bare truth can speak for itself. This article trashes all that. Your implication that low tax regimes are often, shall we say, a little less transparent that citizens should want for their authorities, holds merit in general. However, when you stretch that to imply that 'we' (Britain) are no better than 'them', the article slips into the willfully disingenuous. It's also interesting to see that, since this article was published, Britain has done a much better job than other European countries in terms of economic recovery. If we are to be honest in our reporting, this should be applauded just as governmental foul-ups are criticised. The recent crackdown on immigration, for example, which will cost many, many jobs as well as millions of pounds in exports on reduced foreign student numbers alone, is a shambolic (if populist) mockery of those attributes that Britain should be selling to the world. As we said in yet another post, our return to growth this summer was an inevitable part of the boom-bust cycle that Gordon Brown ineptly said was dead. Osborne can take scant credit for this I think. Also, the recovery is not happening for most of us - with incomes stagnating and prices rising. IDS just another damaged boy in a suit. He alone saved Tony and delivered the Iraq debacle - because he 'admired him'. . So in order to attract investment funds we create a framework and it is only natural that companies or individuals look for loopholes they can legally exploit. Until you see the results there is little you can do to prevent this happenstance but irrespective of any outcome in this respect. The overall tax take from any operation involving overseas investment here, includes the benefit of employment and all the beneficial effects which arise from having people gainfully occupied. Things you try so vociferously to diminish by cherry-picking. There's a much bigger picture if you look beyond the misery you love to rabbit on about Grow-up Hari.